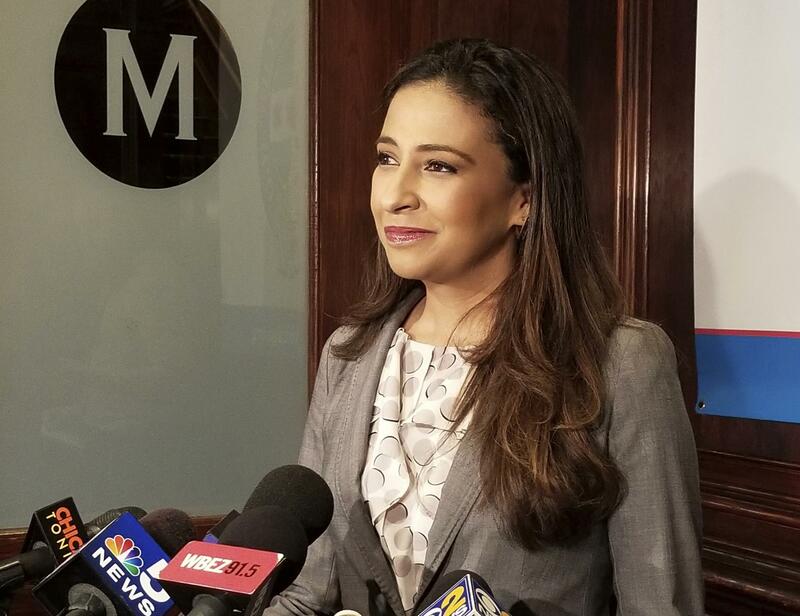 Erika Harold, a Republican candidate for Illinois attorney general, in September 2017 in Chicago. 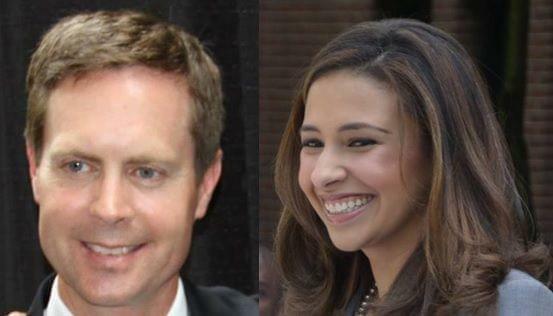 Illinois attorney general hopeful Erika Harold said she wants to increase efforts to stop public corruption while simultaneously staying away from partisan politics—a difficult balancing act for a Republican office holder in a blue state. During an appearance on WGLT’s Sound Ideas, Harold praised current Attorney General Lisa Madigan’s work on consumer protection issues. But she suggested the Democrat, who is not seeking re-election, has not done enough on public corruption cases. Harold will face Gary Grasso, a DuPage County Board member and former mayor of Burr Ridge, in the March 20 GOP primary. The winner would face one of eight Democrats who are vying to succeed Madigan. 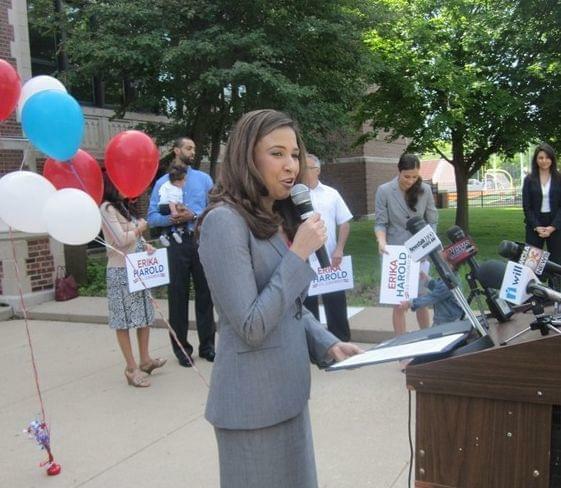 WGLT: Why are you running for Illinois attorney general? Harold: I want to see the office have a less partisan tone to it. I think the office has been used in ways that have been partisan. And that undermines the respect that people have for the office itself. I also feel that we need an attorney general that’s focused simply on enforcing the law and not picking sides and winners and losers. Finally, I want to be an advocate for the interests of all Illinoisans, regardless of their political background. My experience as an attorney and as an advocate taking on tough issues uniquely situates me to the best advocate for Illinoisans. Lisa Madigan has not made public corruption cases a hallmark of her tenure. That’s been more in the hands of the U.S. attorney and the Department of Justice. How much of an emphasis would you put on public corruption cases? I think Lisa Madigan has done a good job focusing on consumer protection issues. I think the office’s focus needs to expand to address issues such as public corruption. I announced my candidacy back in August 2017, and I’ve done 150 events with voters throughout Illinois since then, and public corruption routinely comes up time and time again. And by public corruption, I’m not talking about using the office as a way to punish political opponents. It’s making sure that people don’t have to have political connections if they’re applying for a job, or if their organization is applying for a grant. Public corruption is something that has a real economic impact on Illinoisans and undermines people’s respect for government itself. How do you handle the politics of public corruption cases? There are a couple of ways you can use the office to address public corruption. One is making sure FOIA and the Open Meetings Act—both of which the attorney general has opportunity to enforce compliance … making sure public bodies comply with those laws is one way you can empower the media and watchdog groups and citizens to make sure their government is as transparent and accountable as possible. Because addressing public corruption isn’t just about the attorney general. It’s also about partnering with (county) state’s attorneys. The attorney general has concurrent jurisdiction with state’s attorneys on a wide variety of issues. And in order to use those offices’ resources in a very effective and streamline manner, there needs to be greater collaboration. But the attorney general also needs additional tools like the ability to issue more subpoenas, the ability to convene more statewide grand juries to be able to fully address the issue of public corruption. Many states have decriminalized marijuana to various degrees. Some have legalized it outright. Illinois has medical marijuana already. Do you think marijuana should be fully legalized in Illinois? I think legalization is inevitable in Illinois. And as a result, I think we need to take steps to bring all the stakeholders to the table to make sure we can assess what that would look like in Illinois. And make sure we have regulations in place, that it’s regulated well for safe, adult use. There are obviously a lot of complexities that have to be taken into consideration. Because it’s still legal at the federal level. Each state that chooses to move toward legalization needs to figure out how to address that in light of the federal government’s priorities. We know that U.S. Attorney General Jeff Sessions rescinded the Cole memo, which had previously said U.S. attorneys weren’t going to be focusing their resources on marijuana issues. But I do think that our resources as a state are much better focused on the opioid epidemic, which I think is far more destructive. While Illinois is considered a blue state, 12 of last 20 attorneys general have been Republicans. Lisa Madigan’s predecessor, Jim Ryan, was the last one. As a Republican, how would you characterize the state of the Republican Party in Illinois, and what do you think is your role in shaping its future? The state of the Illinois Republican Party is, people are looking for the next ideas that are going to propel our state forward. On both sides of the aisle, people are focused on not just on what they want their parties to stand for, but more importantly what do you want Illinois to look like. Although there’s a lot of disagreement about the causes of these problems, everyone would agree we’re losing too many jobs, we have too many Illinoisans retire outside the state, and we have to do something to turn our state around. We have incredible colleges and universities, incredible resources, and we should not be ranking atop lists of states that are marked by their dysfunction. Both parties are trying to figure out, what are the innovative ways that we can turn our state around and better leverage the resources that we have? We haven’t had many women of color in statewide elected office. We’ve had even fewer who are young, and who are Republicans. Is it important for Republicans to find and support candidates like you if they want to stay competitive in blue or purple states? I think it’s important that both parties be willing to look outside the box for the candidates they nominate. In this election cycle, people are looking for outsiders. They’re looking for people who bring experience from outside the political realm. They’re looking for people whose life experience resonate with theirs. When I’m campaigning, I make it a point not just talking about the policies I’d like to advance and the laws I’d like to help enforce, but I’d like people to know why I care. And I talk about the work I’ve done to try and prevent violence and bullying among students, because I want people to know what’s driven me from an early age, and how that would translate into how I’d fight for them. People are excited about seeing different faces and new faces in politics because people see that what we’ve tried in the past has certainly not worked in our state. It makes them far more receptive to new ideas and new people.